Three little kitties holding up either a tealight or small votive holder. Polyresin, bronz color, 2"..
Amethyst, long prized in jewelry for its beautiful, violet coloring and within the spiritual communi.. These brass fixtures feature a unique design allowing them to hold both regular tapers and smal.. This brass candle holder can support narrow taper candles, 1 1/2" diameter pillar candles, and any o..
Citrine, a beautiful crystal with a warm, reddish coloring, is typically known for its use within fi.. Hearth Tealight Holder 5 1/2"
A charming little tealight or votive holder representing the home and hearth. 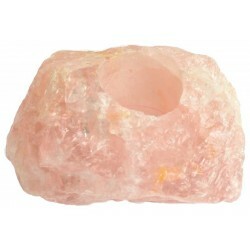 This piece would fit e..
A beautiful candle holder thas has been carved from a natural formation of rose quartz, creating a c..
Serenity from a single hand. This elegant mudra form of fingers and hand is a symbol of blessed enli.. Allowing for candles of various sizes, ranging from taper candles to tea lights and pillars, this so.. This rounded Selenite tealight holder will hold a tealight and diffuse the candle light through its ..